Born in Ballarat, Gilda Gude became known as a painter and teacher. The Sister of Nornie Gude, Gilda also studied at the Ballarat School of Mines (SMB) Technical Art School, and was awarded a part MacRobertson Art Scholarship in 1937. Gilda Gude won the Melbourne Royal Art Society Drawing Prize in 1952. She lectured in art at RMIT from 1961. Her work is represented in the National gallery of Victoria and the University of Ballarat Art Collection. We are currently seeking further information on Gilda Gude. If you are able to assist please email the curator c.gervasoni@federation.edu.au. This biography written by Clare Gervasoni, 4 June 2008. 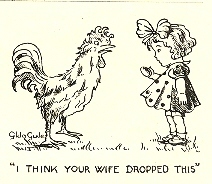 Image caption (RHS)- Cartoon by Gilda Gude, as published in the SMB Students' Magazine, 1934. 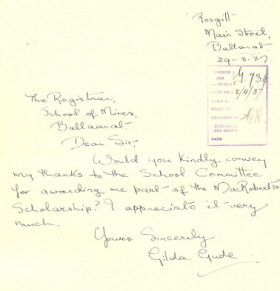 Image caption (LHS)- Gilda Gude's letter to the SMB Council thanking them for offering her a part MacRobertson's Scholarship, 20 March 1937.